Tangy cream cheese makes a great addition to a wide variety of baked goods, from cheesecake to cream cheese frosting. These Mini Chocolate Chip Cookie Cheesecake Bites combine chocolate chip cookies with cheesecake in an unexpected and delicious way. The bite-sized cheesecakes have equally tiny chocolate chip cookies as their base and as a topping, bringing in flavors of butter, brown sugar and – of course – chocolate without having to make traditional crusts. You’re going to need some miniature chocolate chip cookies to make these cheesecakes. You can use my homemade Tiny Chocolate Chip Cookies or store bought cookies. Trader Joe’s has some great miniature chocolate chip cookies and you can even use something like Cookie Crisp cereal if you can’t find any other tiny chocolate chip cookies. You want the cookies to be crisp and small enough to fit in a mini muffin pan. The homemade cookies work extremely well, so make those if you don’t see any store-bought options (plus, they’re even more delicious than store-bought). One cookie is placed on the bottom of each cavity of a mini muffin pan, then vanilla cheesecake batter is divided evenly into each cup. The batter is very easy to make and comes together in seconds in the food processor, though you can also bring it together using a hand mixer if you prefer. You’ll need about 1 1/2 – 2 tablespoons of cheesecake in each cup. A second cookie is placed on top of the cheesecake filling. Use a nonstick mini muffin pan if possible and grease your pan well to ensure that you get an easy release on the mini cheesecakes, which can tend to stick to the sides of any pan. If they do stick a bit, simply run a small knife around the outer edge to release them. The shouldn’t stick on the bottom where the cookie is, which helps to get them out. When the cheesecakes first come out of the oven, the cookies on the top will be crisp. This creates a nice textural contrast with the cheesecake, but you’ll get the best flavor from the cheesecake after refrigerating these treats, even though that will soften the top cookies a bit. The bottom cookies will hold their shape, but will also be tender. They’ll keep for a couple of days in an airtight container in the refrigerator, but in my experience these little cheesecakes don’t last very long. Preheat oven to 350F. Grease a 24 cavity mini muffin pan (or 2 12-cavity mini muffin pans). Place one mini chocolate chip cookie in each muffin cavity. In a food processor, combine cream cheese, sugar, egg, vanilla and salt, then whizz until well-combined and smooth. This can also be done in a large bowl using a hand mixer. Divide cheesecake batter evenly into prepared muffin cavities, placing about 1 1/2 – 2 tbsp of batter in each cup. Top cheesecake mixture with remaining mini chocolate chip cookies. Bake for 10-13 minutes, or until cheesecakes are set. Allow cheesecakes to cool in the pan, then remove them (slide a knife around the outside of each cup to loosen them if needed) and refrigerate until ready to serve. 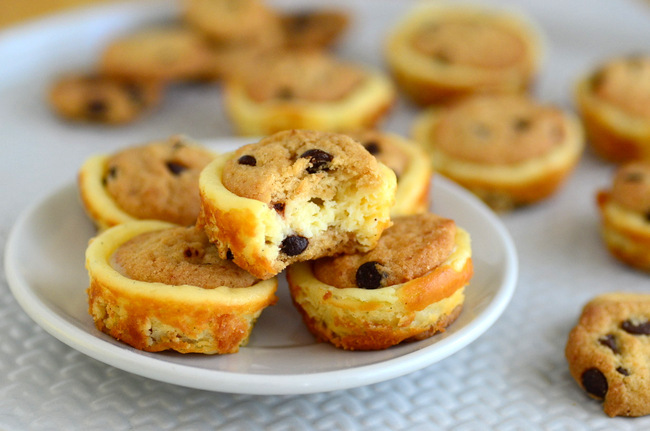 The post Mini Chocolate Chip Cookie Cheesecake Bites appeared first on Baking Bites.